CappersMall and Draft Kings bring you a fantasy football contest for NFL week 6. If you haven’t tried these fantasy leagues – give it a shot! Click here to reserve your spot (first come, first serve). Reserve your spot above and than you can edit your team closer to game time if you choose. 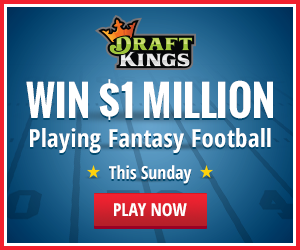 DraftKings prizes guaranteed no matter how many entries. It will go on no matter what. Contest will not cancel.